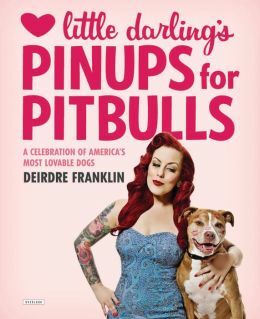 Interview with Deirdre Franklin (Pinups for Pitbulls) on her new book & more! 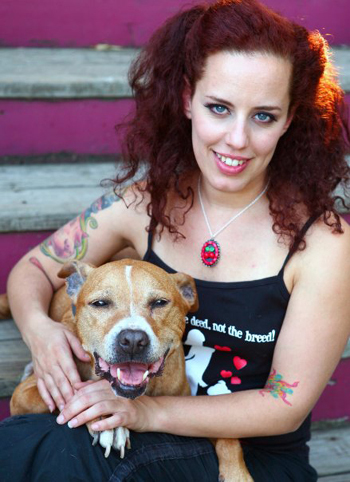 In 2005, Deirdre ‘Little Darling’ Franklin founded Pinups for Pitbulls (PFPB), a nonprofit organization whose mission is to educate the public, raise awareness, and fight against pit bull breed discrimination. Why pit bulls? As some may be aware, our society has unfairly maligned pit bulls: the fear and stereotyping of pit bull type dogs has not only led to breed bans, but also to a disproportionate number of them being killed in shelters nation wide. PFPB was created to reduce the killing of healthy, adoptable pit bulls in shelters, and to dispel the myths and stereotypes surrounding the breed. Little Darling’s Pinups for Pitbulls is PFPB’s first book and is illustrated with beautiful images from the calendar. In this interview, Deirdre describes the book, discusses the inspiration behind founding the organization, her furbabies, the wildly popular annual calender that started it all, and of course, pit bulls! When you’re done reading, be sure to order a copy of her amazing book! Congratulations on the book! Little Darling’s Pinups for Pitbulls is beautifully written and designed. Can you describe the process of making the book – choosing the photographs, the design, format, writing process, etc? It was intense! I worked closely with my editor from start to finish to put out a book that would be palatable enough to someone who might not know anything about BSL. I wanted it to be well-balanced in its ability to inform but also be attractive enough that it could be picked up by someone based on curiosity alone. I wanted to include images from the early days of Pinups for Pitbulls when photographers would submit images with their model and dog team. The format and themes have changed so much over the years and it shows our natural progression toward a more simplified approach to themes and the structure of the image itself. We want to always show the human-canine bond in each image while still creating something that is recognizable as “Pin-Up.” The writing process was the hardest part for me. I recently finished grad school with an M.S. in Public Policy. I had been a creative writer my whole life and had a tough time switching to scientific writing. I had just come out of defending my case study on the topic of Breed Bans and had to reprogram my brain again to speak from the heart and work creatively. It’s amazing what the mind can do with a simple shift in perspective! Overall, it was incredible. Seeing the book after a year of back and forth with my editor was something that I have had a hard time describing. It was nothing short of magical. What inspired you to start your organization, Pinups for Pitbulls? I was concerned about all of the breed specific legislation that was being enforced in places like Denver, CO where innocent dogs were being removed from loving homes because of their appearance or assumed breed, rather than behavior. I wanted to do something that would bring attention to this concern and that could help educate the public about laws affecting dogs. Our annual calendar has been an amazing tool in getting media attention so that we can help shed light on this issue that affects many cities in our nation to this day. While most cities are removing their breed bans, some are still considering it. We want to arm the public with science-based facts and we can do so once we garner their attention. What are some common misconceptions people have about pit bulls — such as those that give rise to breed specific legislation? How do these misconceptions form and how has the organization tried to address them? The misconceptions often lie in the assumption that you can categorize a dog’s behavior by breed alone. The deeper issue is that all dogs are individuals and that the dogs known as “pit bulls” are commonly mixed breed shelter dogs that happen to fall into some conformances of the purebred American Pit Bull Terrier, such as having muscular bodies, stocky builds, and large heads. None of this matters as much as what you put into that dog in terms of training, diet, exercise, environment and love. Another issue is the way the media reports dog bite stories. They will call a chained dog that has lived outside its entire life a “family dog” in a report. This is anything but true. A family dog lives inside and is trained and loved by his family. A chained dog is more of a resident dog and can become a dangerous dog simply by being neglected, underfed, and often abused. We, in the dog advocacy community, do not want to see any dogs living on chains and would like to ensure that they have proper supervision. This would help reduce dog bite statistics and would keep communities safer, while also keeping dogs from suffering in the elements alone and without their people. Dogs are social creatures and they benefit from our TLC as much as we do from theirs. Our organization works to not only undo existing breed bans, but also to stop them before they become law. We travel nationally to events such as tattoo conventions, comic cons, and pet expos to help arm the general public with science-based facts. Additionally, we have spoken with legislators, city council members, and of course, the media to help give them the right information to keep communities safe through breed neutral laws. What are some of your organization’s efforts to reach a broader audience? We don’t rely on social media, but instead use our social media reach to bring people out to all of the events that we have a booth at nationally each year. We attend events where we are not “preaching to the converted” but rather offer a safe space for people to visit us in a place like a comic book convention where people can express their perceived concerns about this issue and then walk away with educational resources, science-based dialogue and a lack of judgment. Besides the calendar, what else does your organization do? The calendar is very little of what our organization does to educate the public. It’s a tool that we use to garner necessary attention but it’s about 1/10th of our annual efforts. We have street team volunteers in nearly all 50 states and across the globe. We work directly with our volunteer team to educate them so they can go into their community and work on a grassroots level to educate their region. We also host event booths at various events nationally and I give a keynote address at various pet expos from coast to coast each year. We also work directly with rescue groups and individuals to help rehome dogs in need through courtesy posts on our Facebook fan page, where we have helped to find homes on an average of 35-50 dogs per month, simply by using our popularity and large-scale network that we have built from the ground up. Additionally, we’ve become a trusted resource for releasing news. We vet all of our sources before posting any news stories and as a result, we are a go-to page for current events. Pinups for Pitbulls will be turning 10 soon. How has the public response to your organization changed since you started? The public response has been amazing! We’ve grown our reach exponentially each year. We have nearly half a million Facebook fans alone! We are excited to see a large-scale community that started in my living room nearly 10 years ago and now spans across the world. We even receive orders fairly regularly in our web store from places like Germany, Switzerland, New Zealand, Australia, and the Netherlands. How do you find your pinup models and pit bulls featured in the calendars? We host an annual open model call. This year’s model call will run for a longer period than it has in the past. We will open the call sometime in January and will end it sometime in March. The shoots will take place in Philadelphia, PA at Celeste Giuliano Photography this April! You’re the first to receive this info. We have an application process that allows people to submit their dog only, themselves without a dog, or a model with a dog. You don’t need any modeling experience, but preference is often given to applicants who work in advocacy of some kind. They have to care about our mission and have a desire to work with our organization throughout the year that they’re featured and hopefully beyond. Many of our calendar models from the past have been with us for the entire 10 years! The most important aspect is that we are looking for people dedicated to the cause who will help us directly in spreading the word and raising funds through merchandise sales or donations. This is how we continuously support the organization. What can someone do in their community to help pit bulls? They can help by volunteering with a rescue group or shelter. Talk to their local shelter about needs in their specific community i.e. bringing awareness about low-cost spay and neuter programs. They can help educate dog owners and non-dog owners about laws such as BSL and proper care of dogs, anti-tethering campaigns, and much more. We think people should look to their local community and assist that region first when possible, since we can spread that kind of education at home and keep BSL from becoming a conversation. We also would encourage anyone interested to join our street team as a base for volunteering with us. They can email us through our website contact form. What’s next for you and the organization? I will be spending 2015 on the road to help further our mission and to sign books along the way! We’ve also opened a retail store called DARLINGS in Asheville, NC as of last week that houses all of the Pinups for Pitbulls, Inc. merchandise. We will not only be selling Pinups for Pitbulls, Inc. merchandise, but we’ll have a speaker series, adoption days, fundraising events, and now finally have a place that people can visit and meet us face-to-face. We’ve longed for this day and it’s finally here! Lastly, tell us about your fur babies and how they’ve impacted your advocacy! Carla Lou was my first pit bull-type dog and lived to be eighteen years old. She was the love of my life and continues to be the driving force behind our mission. She inspired me to start Pinups for Pitbulls, Inc. and continues to fill me with inspiration even in her absence. You can read all about our story in my new book! We lost two dogs in the last two years to cancer; Carla Lou and Lexi. Lexi passed in April 2014 but was a beautiful rescued Lab/Shepherd mix. She was fourteen and died from a Hermangiosarcoma. Baxter Bean is also featured in the book and has been in my care since he was 6 months old. I foster-failed him (kept him) because he was the saddest dog that I had ever met. He was covered in burns from the base of his neck down to the back of his hips from either having been set on fire or a caustic chemical. It took him nearly a year to become a dog and to gain a playful attitude. He had Carla Lou and our dog Howie (a pit bull/greyhound mix) there to teach him how to be a dog and the loving TLC that we had in our hearts to see him through. He’s now 9 years young and loves living in the mountains of NC. Zoe is our Harrier mix and is fourteen and a half. My husband had rescued her when she was 2 months old. She is a supreme athlete and outdoor enthusiast that loves long car rides, mountain hikes and camping. Believe it or not, not only has being a dog parent itself affected our advocacy, but even when we travel for events with our dogs in this day and age, we have to consult a “BSL” Map in order to ensure our dogs safety. It feels ridiculous like we are harboring fugitives and is simply unfair. This clearly affects our daily work as we try to rid our great nation of BSL for good. Little Darling’s Pinups for Pitbulls is in bookstores now! Also available online at Amazon and Barnes and Noble. I love this interview and the idea behind it. I’m Australian, and the state I live in, Victoria has all these terrible rules regarding pitbulls. If you have a dog that looks even remotely like a pitbull council workers can seize the dog and have them euthanised for being a ‘dangerous dog’ if you don’t have papers, never mind if your dog is a pound puppy with none. It’s such a horrid and untrue assumption and even reasonable people can be fooled by it which is so frustrating. As a dog lover people just assume that I don’t know what I’m talking about when I say there not dangerous. I’ll definitely have to put this book on my Christmas list!